Michael Thompson visited Garaje to talk at our GIF event last March 21. His talk was about on Artificial Intelligence and how designers and researchers can create a more human-centered experience and he did it in English so here’s our summary in English too: ). Michael, former Global Director of UX at Telefónica, is a consultant in Customer Experience Strategy and a Professor at IE and ESNE. He’s a very inspiring person with a wide experience in the design and user experience world who gave us a different vision on how to fight the threatening presence of AI nowadays. AI is based on algorithms that solve cognitive problems commonly associated with human intelligence, such as learning, problem solving and pattern recognition. That’s why Michael understands that AI can be successful when design and research work together. 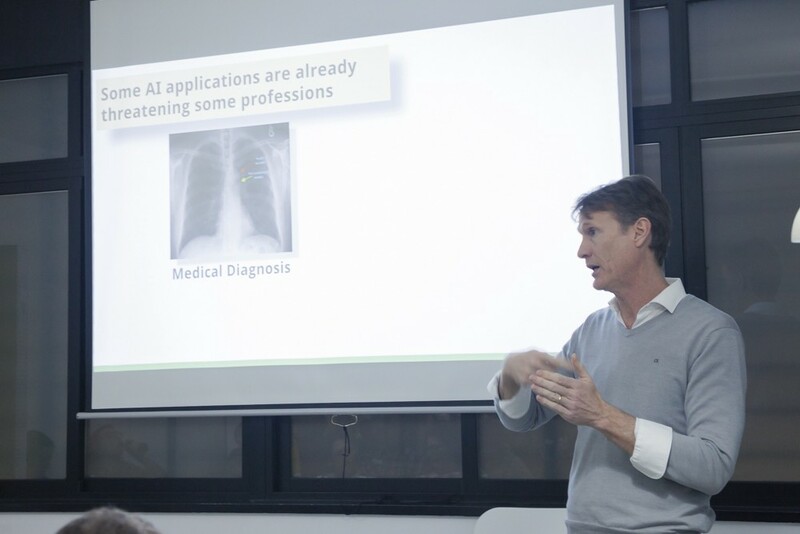 Michael explained how AI is still far away from providing products and services with a more human-centered experience. There’s a big gap between data scientists and designers and the value that design can bring to AI. We all know that artificial intelligence is everywhere nowadays: image and voice recognition, chatbots, route planning schemes, recommendation engines, etc. There are dozens of products and services based on AI that we use everyday. More and more we notice that applications based on AI provide with a product or service where the expert becomes redundant. For instance, medical diagnosis and X Ray diagnosis where AI is better prepared to give a more accurate diagnosis than humans. Could this happen in the near future of the UX/UI jobs too? Asymmetric and distorted perceptions of value. Very often the intention of using AI doesn’t offer value. Customers are pushed to buy more and AI is used as a marketing tool driven by sales and not to add a real value and create an experience for the customer. Adaptation and system gaming. There are lots of applications which use AI to predict where more crimes are reported. Then the police send more patrols to those areas and obviously, due to their presence, they discover more crime hence the crime increases in those areas. The data is feeding the system and creating more crime. Feedback loops. AI is supporting flying piloting systems to give autonomy to pilots. However, if pilots don’t get hours of practice, they can be unable to tackle emergency situations due to the lack of experience. This is an example where AI has an impact on people’s lives. Hyper-dependence. Michael mentioned there are lots of studies that prove the atrophy on the part of the brain which reacts to spatial recognition due to the use GPS applications. Based on these type of failures, Michael believes designers could help AI to get out of this trap of design systems that don’t fit. He thinks designers should be more involved in the whole process of an AI project. Facilitation and inclusion designers’ skills that are key to get the right people in the right place and getting to solve the problem in a more effective manner. It makes projects so much richer and more likely to solve all stakeholders’ problems with a more human-centered perspective. In examples such as the lack of practice on plane pilots mentioned above, AI could make a positive impact by extending the knowledge of pilots and instead of thinking for them. Most importantly, it’s hard to understand very complexed algorithms working behind artificial intelligence especially to end users. Presenting them in a way that makes sense is a designer task. Currently Michael is working on a research paper to further study about AI and UX and we can’t wait to read his final conclusions on the subject. SuperIntelligence by Nick Bostrom —about the future of AI. 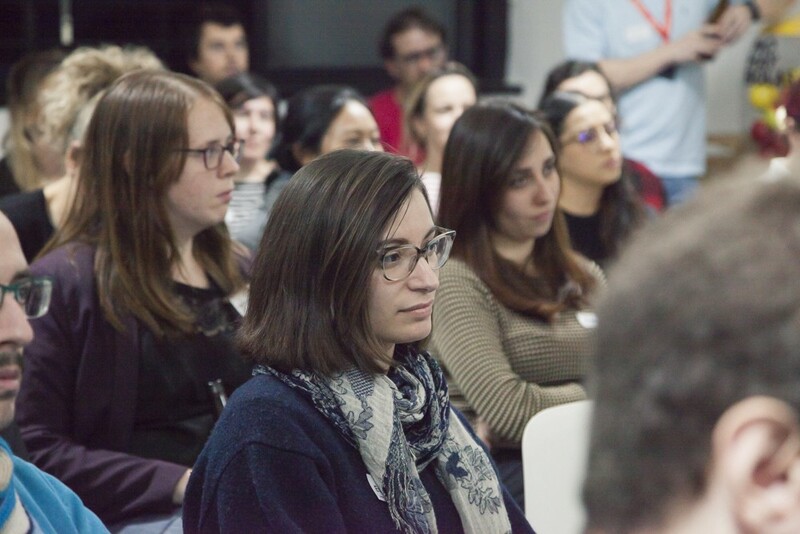 GIF is an event we do every two months where we share stuff about design with the design community. Hope to see you in the next one! Sign up to our newsletter and stay tuned. We're a Strategic Design & Innovation Studio. Making Innovation Tangible. Un lugar para inspirar, acoger y reflexionar sobre el diseño y otras materias.